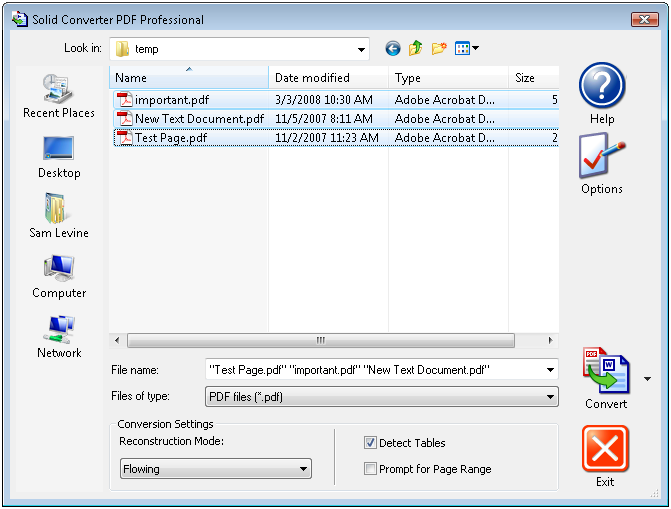 Normally in Solid Converter PDF you'll use a wizard menu to convert PDF files to DOC. As you progress through this wizard many conversion options will be made available to you. This is useful if you convert PDF files infrequently, as it reminds you what options are available and provides an idea of what they do. The downside to this is that if you have to convert several files (5, 10 or even more) you have to click through the wizard for each and every PDF file. This obviously isn't optimal. A better solution is to disable the wizard in Solid Converter PDF to Word when you need to convert several PDF files to DOC. You can then select a range of PDF files in a folder and convert them all at once. 1. Open Solid Converter PDF and go into Options General Uncheck "Use Wizard" and "Launch Editor", then click OK.
3. Select the folder you wish to place the converted Word DOCs and click OK. Your PDF files will be automatically converted to DOC. If you're happy with the conversion you may wish to go back into the Options menu and re-enable the options you disabled in step 1.